Each year from the middle of December through early January, Christmas bird counts are organized worldwide. These counts consist of the identification and registration of the number of bird species observed in a given period of time. This tradition has been established in the world of bird watchers and is taught to each new generation. 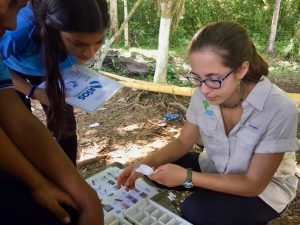 The Osa Peninsula is no exception to this tradition, as different organizations collaborate in December for one day to participate in tracking the progress of endangered species and assessing the impact of environmental threats on birds and their habitat. This year, children and young people from educational centers of the Osa Peninsula, through the coordination of teachers and local organizations, will be responsible for carrying out the first Osa Peninsula Children Christmas Count 2017. This event is possible thanks to the coordination and collaboration of several institutions and organizations: Osa Conservation, Neotrópica Foundation, University of Costa Rica Golfito Campus, Ficus Tours, Osa Birds, Osa Wild, Utopia Drake Outdoors, Osa Birders Tours, Lapa Rios Lodge, Danta Corcovado Lodge, and La Palma Academic College. 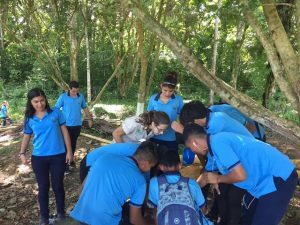 They will lead guided walks around each school, lecturing about the birds that frequent the places and that are observed daily by the children. 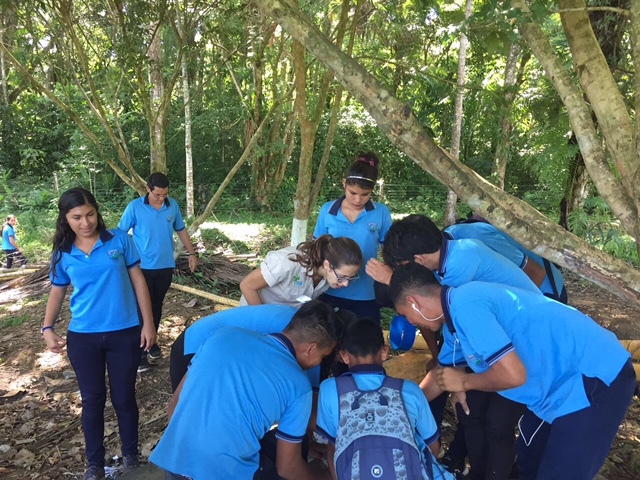 The purpose of this activity is to improve the relationship between the young population, birds, and their habitat, in order to create new guardians of the natural heritage of the Osa. 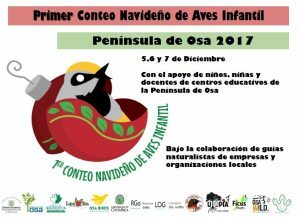 The Christmas Children’s Bird Count will take place on Tuesday December 5 – Thursday December 7, 2017 of this year with the participation of 17 educational centers in different sectors of the Peninsula including the communities of Carate, Piro, Carbonera, Saturnino Cedeño of Puerto Jiménez, Dos Brazos of Tigre River, Gallardo, Cañaza, Agujas, Guadalupe, Riyito, La Palma Academic College, Alto San Juan, Chal Bay, El Campo, Admiral de Banegas, Rancho Quemado, and Aguilas de Bahía Drake. Through experiencing nature and research, each of the participants contributes greatly to the monitoring of the health and long-term condition of bird populations and contributes to their conservation worldwide. 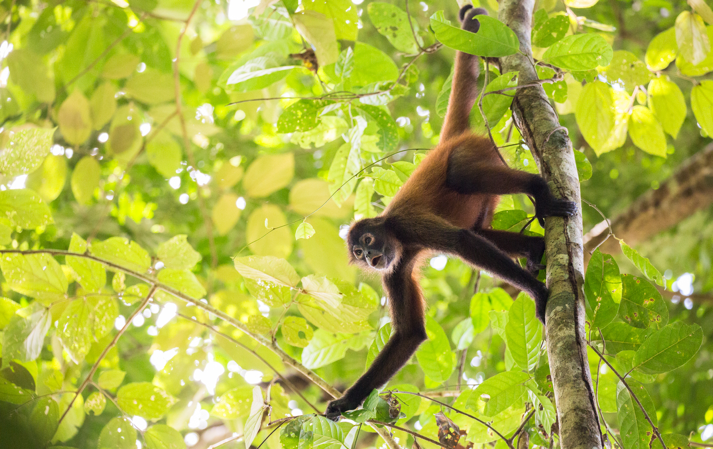 Earlier this year, I spent many hours following the endangered spider monkey in the Osa. As part of a new project being carried out by Osa Conservation and my own research with the University of Exeter, I looked for sleeping sites and latrines to better understand the ecological role of spider monkeys in seed dispersal and their potential to regenerate rainforests. Spider monkeys live in fission-fusion societies that split into smaller subgroups and fuse into large subgroups. 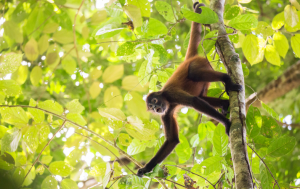 At night, spider monkeys use specific “latrine sites” to excrete at key sleeping trees. These latrines are communal toilets and provide a perfect location for us researchers to examine how the rich fruit diet of spider monkeys are impacting the plant community. 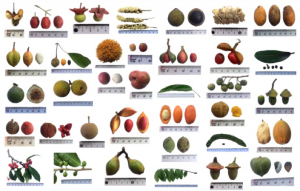 During my research, I successfully found 41 sleeping trees and 30 latrine sites. The sleeping trees were mostly large trees with long lateral branches, but some spider monkeys also slept in very small trees. 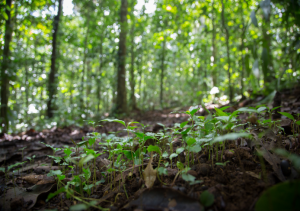 Latrines were composed of many young tree saplings, excreted seeds and poo! 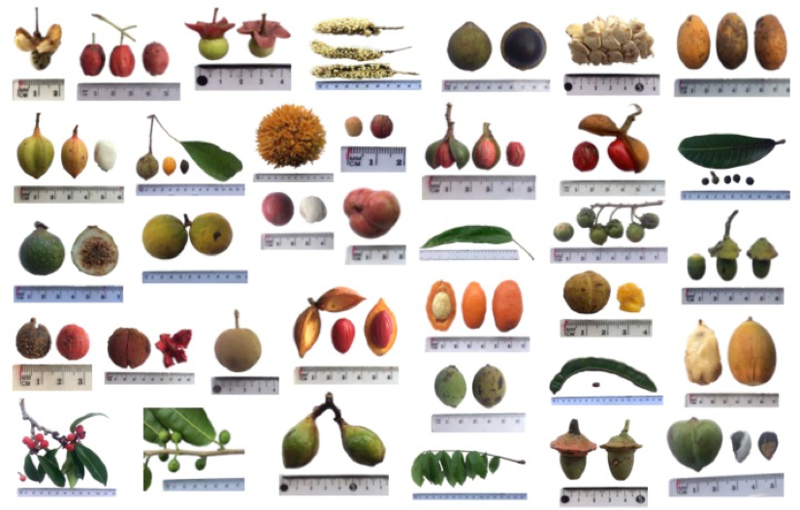 I also found they consumed 32 species of fruit as well as other foods, such as epiphyte leaves that they feed on to add protein to their diet. If you missed our previous video blog about this project, please check it out here to learn more! The Battle: Sea Turtles vs. Predators! Nature is not always kind; sea turtles face a multitude of life threatening obstacles that reduce their chance of survival throughout their lives. Predation of eggs, hatchlings and adults by numerous predators is just one of the risks. Raccoons, coatis, opossums, crabs, dogs, birds and ants attack nests to indulge in an egg or a young sea turtle. 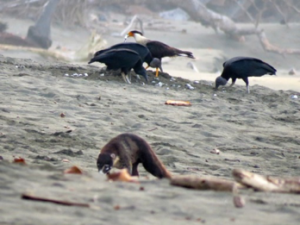 Once the hatchling emerges from the nest, the challenge continues as hawks, pelicans, frigate birds, crabs and fish await a bite-size meal. 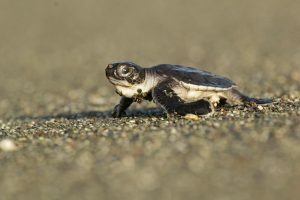 Once the hatchling defeats the odds of predation in their younger years, they reach adulthood where they are relatively safe from such threats, excluding the occasional shark attack. In the Osa, the coati populations have increased largely because of a change in the ecosystem balance with a decline of apex predator populations due to habitat loss and hunting. As the number of coatis increases, more of them are taking to the beach in search of food and often finding sea turtle eggs for their dinner. This unbalanced ecosystem is having a cascading impact on the survival of these sea turtle nests and increasing the need for us to help protect these vulnerable nesting areas. Unfortunately, natural predation is only one of the factors contributing to sea turtle population decline. Human actions can also have more of a direct threat to sea turtle survival. 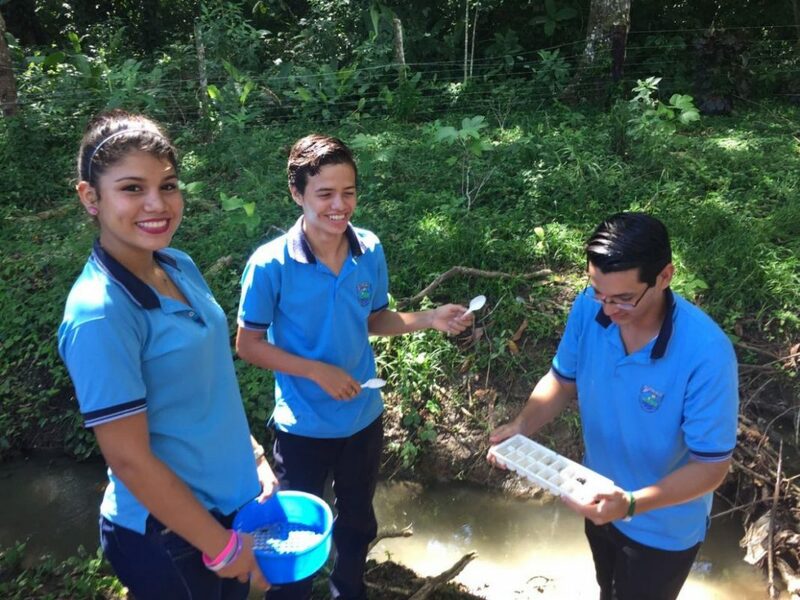 In many coastal communities, especially in Central America, sea turtle eggs and meat can be a source of food and income, although often illegal. During peak nesting seasons, turtle poachers have been known to raid the beaches at night looking to steal eggs from nests, which can unfortunately are often sold to those willing to pay. Here on Playa Piro and Peje Perro, sea turtle nests are threatened more by predation than poaching. Our Sea Turtle Conservation team works hard to reduce human-induced threats and to restore the natural ecosystem balance needed to save the sea turtles. 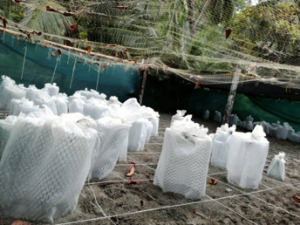 This year, our sea turtle hatchery has already protected over 200 sea turtle nests and helped us to release over 7,000 hatchlings already this year! We are greatly appreciative of all our our conservation volunteers & visitors that help us protect these amazing and ancient creatures! Click here to learn more about volunteer opportunities with our Sea Turtle Conservation Program!